A new level of quality. Did you know that Kitchen remodeling has the highest average return on investment when selling your house followed by bathroom remodeling, so it stands to reason to hire a qualified contractor with extensive experience and a good track record. It is a good idea to check references and have a look at the contractor’s previous work. Save on Energy Costs: A remodeling project can bring in new products and materials that will save you money in the long run. Simply updating to an Energy Star refrigerator or dishwasher and installing halogen dimmable lighting, motion sensors and timers can cut your kitchen’s energy use in half. Most of your remodeling budget will likely go towards essential appliances, cabinets, plumbing fixtures and stone. Therefore, selecting quality products that will give you the most for your money is of the utmost importance. With the abundance of brands and styles, it is hard to know what to choose. 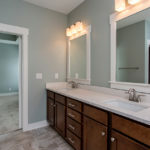 That’s where K&K Homes Inc. can help, with years of experience in remodeling and building new homes we have a long list of trusted trade partners that can give you the best price with the quality you are looking for. Answer any questions you have about design, products and colors, as well as anticipate and prevent problems that you may not have considered. Along with having a good understanding of our clients’ needs and their budget, K&K Homes has extensive knowledge of all the products involved in remodeling, and can advise their clients as to quality, and cost effectiveness. Great attention to detail is paid to all areas of the remodeling project and Kevin and Kelvin supervises every aspect of the onsite remodeling work. They are always available to discuss any issues the clients may have. They use the same Trade Partners that they use when building their new homes, so the same quality and attention that they put into their new homes will be given to your project. Estimates are extremely detailed and a strict time schedule is adhered to. Add Needed Space. Redoing a kitchen, attic, basement or adding on can create more room and more storage in and around your home. Enjoy the many benefits to an efficient home. Better insulation, heating & cooling, UV protection and ventilation provide comfortable living areas. Great things come with a home’s remodeling. One that tops many of our client’s lists is the satisfaction gained from knowing that they’ve taken cared of their homes, their families and investments by improving and remodeling when and where they can. When it’s time to remodel, get the price and the quality you deserve with the help of a professional contractor.